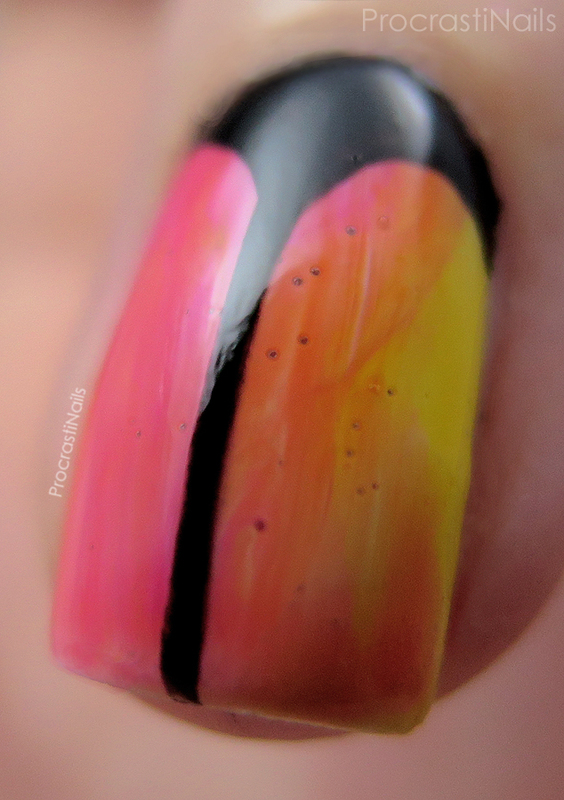 I was playing around with the Essie Silk Watercolours and ended up feeling like a parrot! In the best way possible! Aren't you in love with how these turned out? Ahhh! It's been about a week since I last fawned over this years' mainstream jelly offerings, and that's too long! It's time to remind myself (and all of you) about how amazinggg these polishes are! Today I'm looking specifically at the Essie Silk Watercolours (though you all know my love of the OPI Color Paints too). Today I decided to try a more blended gradient look with the polishes, and I'll be honest that when I started I had no specific designs in mind. I started with Essie White Page and had at 'er! I basically went lightest to darkest with Essie Muse, Myself, Art New-Beau and Blush Stroke and applied my polish in with the colours gradienting into each other. To get the polishes to blend you need to have a healthy amount on your brush and you have to allow the wet polishes to overlap and blend while you apply them (which is why I started with the lightest so I didn't stain my lighter polish brushes). You can always go back and apply a bit more of the light shades to blend later. This is a technique you want to do one nail at a time, because once the polishes dry you can't blend them. And seal them with a thick layer of top coat while they're still wet, because that will help the colours bleed (in a good way!) a bit more. Once they were dry I free handed some black designs with acrylic, sealed it with more top coat, and I was done! As you can see up-close the polishes aren't perfectly blended - I think thicker layers of polish would have let them blend more seamlessly, but I still think this looks awesome. This reminds me of tropical butterflies and birds and flowers and I am so in love with them that I feel I need to use all the exclamation points in the world!!! Love!!! 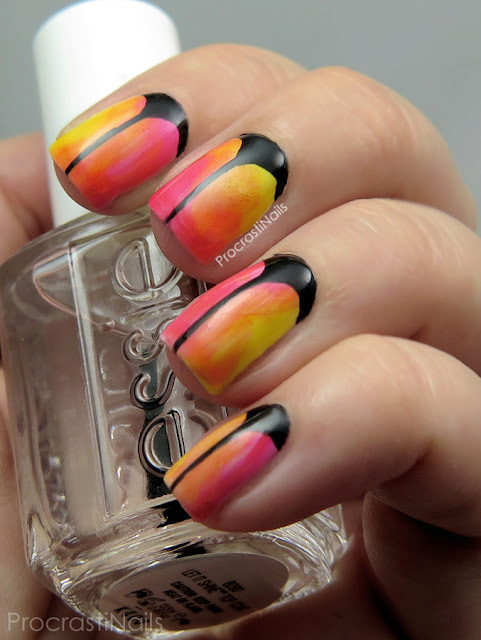 Have you tried a technique like this with the Essie Silk Watercolours or similar polishes? 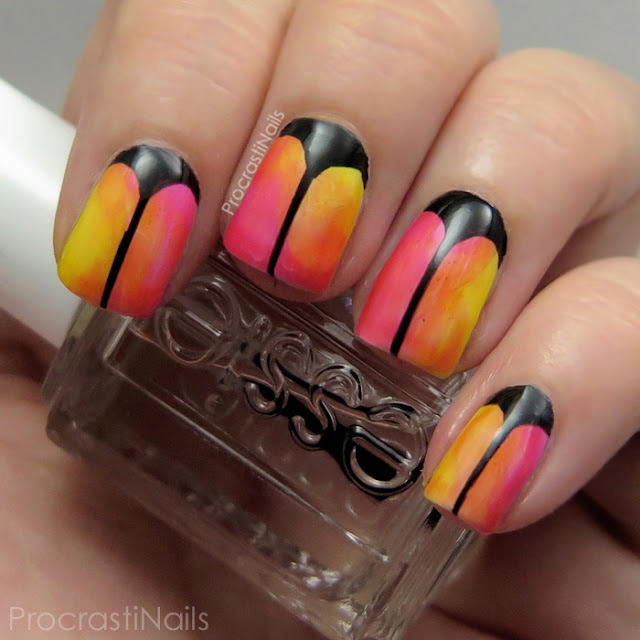 Love the gradient nails you created! Very pretty and painterly! I love all the syrup/jelly polishes that have come out! This is gorgeous! Which collection is easier/do you like better between Essie and OPI? You should do a showdown type post and compare the two. These definitely deserve some exclamation points for sure!!! 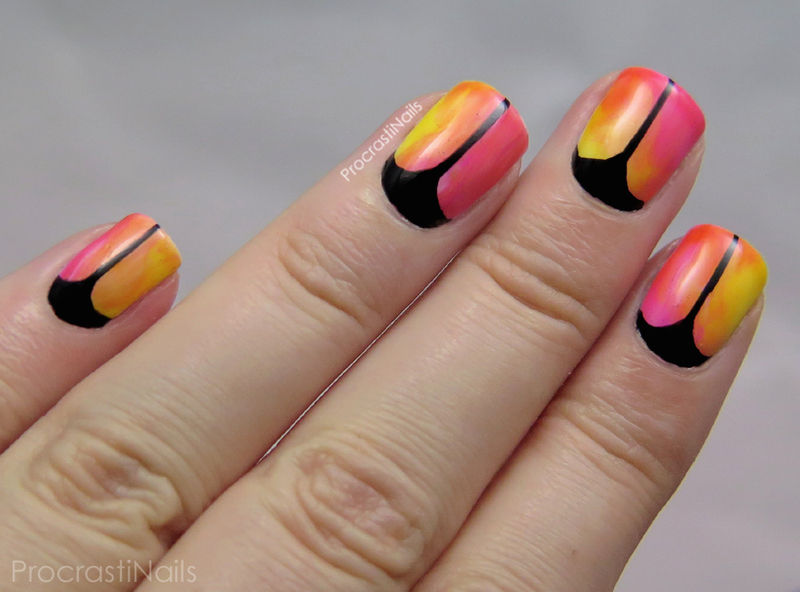 The added black design is the perfect detail to this gorgeous look. Wow, these are awesome!! The colors flow so well together! I saw these at Cosmoprof (tips and sips)! I've been hunting got them! I love what you've done with them! These looks so beautiful and unique. You did a great job on these.